Catching an armadillo is difficult, but it can be done. Some people choose to stalk the armadillo at night as it is coming out of its burrow and try to capture it with a large net. This can be tricky. Armadillos have bad eyesight, but a keen sense of smell. If you are going to try this method, make sure you are downwind of the animal so it cannot smell you. You can try catching an armadillo by hand. If you choose this method, you should know that when startled it tends to jump into the air and then run away quickly. If you decide to stalk it to catch it by hand, the best way to get them is to grab them by the tail and lift them off the ground. They will spin and thrash a lot, but they will get tired. Another way to catch them is by using a live trap. Since armadillos are not exactly the smartest animal, this is an easier method. The trap should be placed near the entrance to their burrow or along the paths they use the most. The easiest way to get them is to guide them into the trap with two logs or 2x4s that are about ten feet long. The cage itself should be at least 12x12x40 inches. If they walk into a space with a low barrier, they will follow the path to its end. Bait you may try to use includes grubs and worms; however, since armadillos are used to digging and rooting around for their food, they may not take the bait. Be wary of using something like soft, overripe fruit. This may attract other animals such as raccoons or skunks. If you manage to catch one in a trap, you can try to relocate it. Take the armadillo far away from your home and release it in a habitat it will like. A forest with plenty of ground level foliage and a water source near may work. It will provide safety, shelter and food for the animal to encourage it to stay. Information about armadillo trapping - analysis and methods for how to trap. Armadillos are very territorial animals. If you do not relocate them far enough away from your home, they will likely return to their old den. To discourage this, fill in the burrow with dirt. Do not pack it too tightly at first. If there are any other animals in that burrow, you want them to be able to get out. Repellents are not effective. Ammonia, moth balls and different kinds of urine do not work. They will not deter them at all. Both professional animal trappers and biologists have proven this through trial, error and research. If none of the above methods work, you may want to shoot the animal. Use this as your last resort. Before considering this method, call a professional trapper and have them try to catch the armadillo. Be well educated about the laws in your state. Hiring a trapper is the easiest way to ensure you are in compliance and will not face a hefty fine. If you are an optimist, think of armadillos as a benefit instead of a nuisance. They normally leave bigger plants in a garden alone. When they root around, the soil is aerated allowing oxygen, carbon dioxide, and nitrogen to reach the roots of your plants. This will encourage growth. How to Catch an Armadillo - Armadillos are a nuisance animal whose habitat is found in both North and South America. They can live in forests, savannahs, grasslands, and even tropical forests. Armadillos are largely nocturnal creatures. They have an armored outer shell that protects them from any predators around. Under the shell, they are covered in fur and soft skin. Most species of armadillo are protected due to their endangered status. The only one that is not and the one you are going to see the most in North America, is the nine banded armadillo. Check your local laws to make sure you are not going about things illegally. Armadillos are normally solitary creatures and tend to sleep up to 16 hours a day. They love to root around in soil and dead leaves looking for worms and grubs. They will also eat small plants, small pieces of dead animals and seeds. 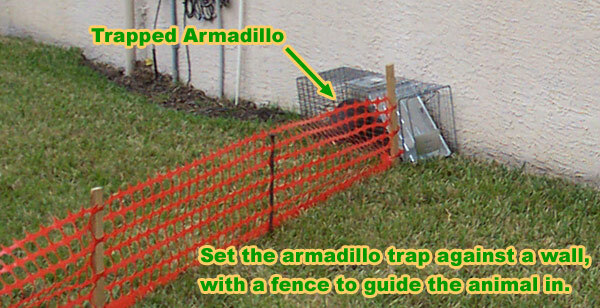 This site is intended to provide information about how to catch an armadillo in a cage trap, so that you can make an informed decision if you need to deal with an armadillo problem. This site provides many armadillo capture articles and strategies, if you wish to attempt to solve the problem yourself. If you are unable to do so, which is likely with many cases of armadillo removal, please go to the home page and click the USA map, where I have wildlife removal experts listed in over 500 cites and towns, who can properly help you with your nuisance armadillo. Click here to read more about how to get rid of armadillos.